Now there is more reason than ever for all poker enthusiasts to join the OlyBet Poker Room - all new poker players are awarded with no deposit €500 bonus and the €10,000 New Player Freerolls offers Players a chance to build their bankroll at zero cost to themselves! If Players are new to the game, this is the perfect way to learn it while having the chance to win real money. You'll get more - just deposit any amount, win your first Fish Party Jackpot SnG and we'll give you same game five €1 tickets for free! Check out New Poker Player Bonus tabs for more details and good luck in play! Players simply need to create an account and the Player will instantly be awarded 28 tickets to enter the daily €50 New Player Freeroll Level 1 Tournaments over a 4 week period! Once a Player has created a new poker account, the Player will need to play at least 10 hands of Texas Hold ‘Em to be instantly awarded 8 tickets to enter the bi-weekly New Player €500 Freeroll Level 2 Tournaments over a 4 week period! Once a player has unlocked the first two levels, it’s time to stretch his or her poker legs. Completing the Level Up achievement will give the Player access to the New Player Freeroll Level Up tournament! 3. Play a Fish Party Sit ‘N Go game. Once all 3 achievements have been obtained, the Player will automatically be awarded 4 tickets to enter the weekly Level Up Freerolls Games over a 4 week period! All new poker players are awarded with no deposit €500 bonus. Bonus is getting converted to real money if you play real money games and collect loyalty points. First €10 of the bonus is released in €1 pieces. For releasing each €1 you have to collect about ~170 loyalty points. Next €90 of the bonus is released in €5 pieces. For releasing each €5 you have to collect about ~850 loyalty points. Next €400 of the bonus is released in €10 pieces. For releasing each €10 you have to collect about ~1700 loyalty points. Depending on your VIP level you earn about 35-45 loyalty points for each €1 rake paid. This offer is valid only for new players who have just created a poker account. The account creation is a moment when player chooses a poker „alias“. Unreleased bonus expires after 60 days from the moment it has been added to players account. When releasing the bonus then both, the tournament fees and cash games rake are taken into account. Just win you first Fish Party Sit & Go in 90 days and you will get 5x €1 Fish Party tickets for free! 1. Greenwich Mean Time (GMT) applies to all times stated in these terms and conditions (these “Terms”). 2. 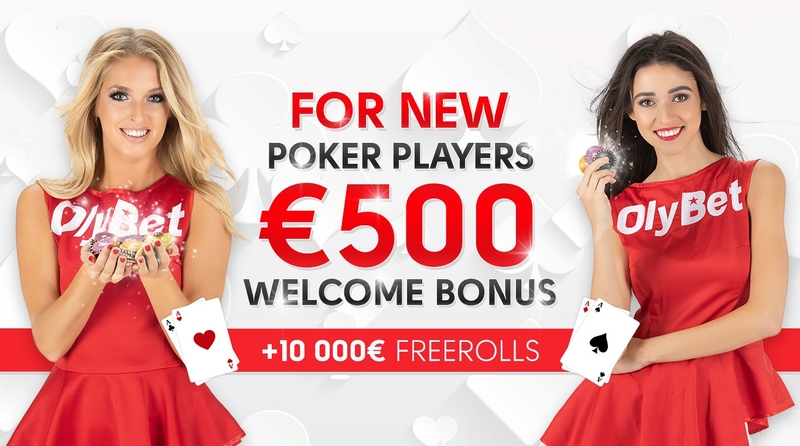 Players may enter the The €10,000 New Player Freerolls Promotion as set out in clause 3 below to stand a chance to win tickets to enter the Level 1 Tournaments, the Level 2 Tournaments and the Level Up Games, where a guaranteed prize pool to the value of €10,000 is available to be won by Players over each 4 week period during the Promotion Period ("Prizes"). 3.1.1 On creation of a new account, a Player will automatically be awarded 28 tickets to enter the daily €50 New Player Freeroll Level 1 Tournaments (“Level 1 Tournaments”). 3.1.2 The 28 tickets for the daily Level 1 Tournaments will be valid and usable for 28 days following the opening of a new account and one ticket grants one entry into a Level 1 Tournament. On expiry of 28 days following the opening of the new account, any unused tickets will expire. 3.1.3 Each freeroll game in the Level 1 Tournaments has a guaranteed prize pool of €50, which prize pool will be split between Players competing in that game, dependant on the number of Players taking part, awarded on a sliding scale. 3.2.1 On creation of a new account, once a Player has played at least 10 hands in the Texas Hold ‘Em games (excluding the freerolls and play-money games) (“Level 2 Achievement”), the Player will automatically be awarded 8 tickets to enter the bi-weekly New Player Freeroll Level 2 Tournaments (“Level 2 Tournaments”). 3.2.2 The 8 tickets to the bi-weekly Level 2 Tournaments will be valid and usable for 28 days following obtaining the Level 2 Achievement and one ticket grants one entry into a Level 2 Tournament. On expiry of 28 days after obtaining the Level 2 Achievement, any unused tickets will expire. 3.2.3 Each freeroll game in the Level 2 Tournaments has a guaranteed prize pool of €500, which will be split between Players competing in that game, dependant on the number of Players taking part, awarded on a sliding scale. 3.3.1.3 Play a Fish Party Sit ‘N Go Tournament. 3.3.2 On completing all of the Level Up Achievements, the Player will automatically be awarded 4 tickets to enter the weekly Level Up Freerolls Games (“Level Up Games”) which are available on the participating Operator’s website. 3.3.3 The 4 tickets to enter the weekly Level Up Games will be valid and usable for 28 days following the completion of the Level Up Achievements and one ticket grants one entry into a Level Up Game. On expiry of 28 days following the completion of the Level Up Achievements, any unused tickets will expire. 3.3.4.2 offers Players a chance to win €150 worth of tickets to enter into the satellite online qualifier games where a Player may compete to win a MPNPT package, which is a prize to participate in a live MPN Poker Tour. 4. When entering the Promotion, Players will be bound by these Terms, as well as OlyBet website terms and conditions and the MPN (Microgaming/Prima) network terms and conditions. 5. Once Players have won a Prize, the winners shall receive a pop-up notification of the win during play on OlyBet Poker, and the Prizes will be immediately credited to the Player’s account. 6. Players may not create more than one account on OlyBet poker room website for the purpose of entering the Promotion. If there is any reason to believe that there has been a breach of these Terms, Prima reserves the right, at its sole discretion, to exclude a Player from participating in the Promotion or to refuse to award a Prize to a Player. If such a breach occurs, OlyBet, at its discretion, close all such a Player’s accounts. 7. OlyBet, in its sole discretion, will decide when the Promotion will close. 8. The decision of OlyBet regarding any aspect of the Promotion is final and binding and no correspondence will be entered into about it. 9. Players accept and agree to be bound by these Terms when they play on OlyBet during the Promotion Period. OlyBet reserves the right to refuse entry or refuse to award a Prize to anyone in breach of these Terms. 10. OlyBet reserves the right to hold void, cancel, suspend, or amend the Promotion where it becomes necessary to do so. 11. The Prizes are subject to availability. OlyBet reserves the right to substitute any Prize for another of similar kind or value without giving notice. The Prizes are non-exchangeable and non-transferrable. 12. Players who don't log in to poker or play a hand during the first blind level will be removed from the freeroll tournament.